Sweet potato casserole. Green bean casserole. Corn casserole. Homemade rolls. Cornbread dressing. And yes, turkey. The memory of Thanksgiving dinner is still vibrant in my mind - all the more so thanks to the fact that I had to work a 12 hour shift at the hospital on Turkey Day, which meant my family had to postpone the celebration until Black Friday. But oh my, was it worth the wait! Clearly this dish can just as easily be made with chicken, which is the more common version. But I urge you, friends, to live on the wild side and use those turkey remnants as an excuse to enjoy every bite of the goodness that is flaky, buttery crust and savory, creamy poultry and veggies. 1 1/2 pounds pre-cooked turkey breasts and/or thighs, shred into bite-size pieces. Mix the flour and salt in a food processor. Scatter the butter pieces over the mixture and pulse in 1-second bursts until the flour is pale yellow and resembles coarse cornmeal, with butter bits no larger than small peas. Turn the mixture into a medium bowl. Sprinkle 3 tablespoons of the ice water over the mixture. With a rubber spatula, use a folding motion to mix the water in. Press down on the dough mixture with the broad side of the spatula until the dough sticks together, adding up to 1 tablespoon more ice water if the dough will not come together. Shape the dough into a ball, then flatten it into a 4-inch wide disk. Wrap in plastic wrap and refrigerate 30 minutes or up to 2 days before rolling. In a Dutch oven set over medium-high heat, heat the oil. Add the onion, carrots, and celery and saute until just tender, about 5 minutes. Season with salt and pepper to taste. Transfer the cooked vegetables to a bowl. Add the turkey, and set aside. Heat the butter over medium heat in the now-empty pan. When the foaming subsides, add the flour and cook for 1 minute. Whisk in the chicken broth, milk, and thyme. Bring to a simmer, then continue to simmer until the sauce fully thickens, about 1 minute. Season with salt and pepper to taste and stir in the wine. Pour the mixture into a 9x13-inch baking pan. Roll the dough on a floured surface into a rectangle approximately 11x15 inches and 1/8 inch thick. Place the dough over the filling, trimming the dough that overhangs to within 1/2 inch of the pan lip. 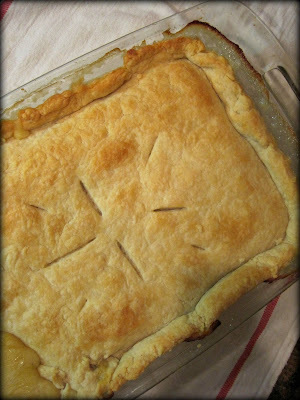 Tuck the overhanging dough back under itself so the folded edge is flush with the pan lip. Flute the edges all around. Cut at least four 1-inch vent holes in the crust. Bake until the pastry is golden brown and the filling is bubbling, about 30 minutes. Serve hot. I specifically bought a turkey after Thanksgiving thinking I would do a pot pie - which, for some strange reason, I have never made before. So this recipe will come in very handy! Thanks!